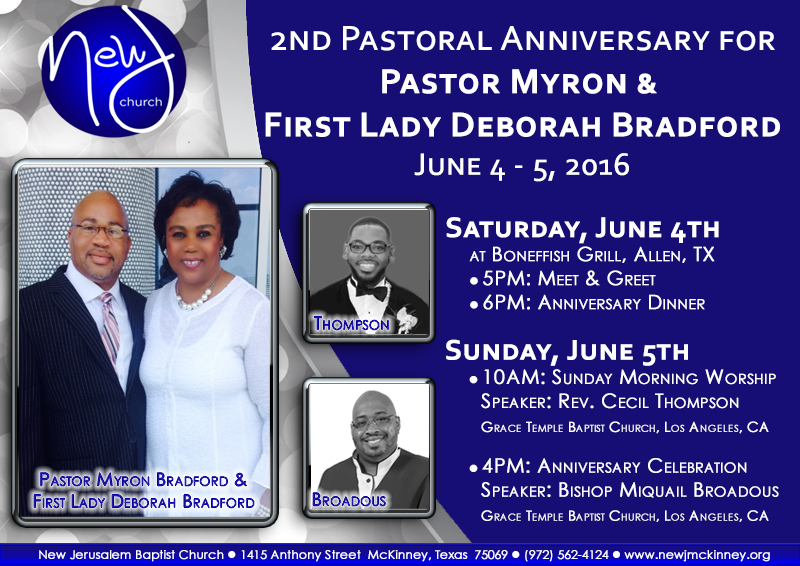 New Jerusalem Baptist Church invite you to join us as we celebrate the 2nd Pastoral Anniversary for Pastor Myron Bradford & First Lady Deborah Bradford on June 4-5, 2016. There are three planned events. Come dressed in your Sunday Best to the Anniversary Celebration Dinner, a ticketed event. The dinner will begin promptly at 6pm, after the Meet & Greet at 5pm, at the Bonefish Grill in Allen, Texas. Tickets cost $50.00 per person. 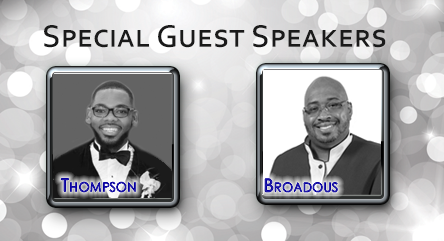 Join the New Jerusalem Baptist Church family, guests and friends as we celebrate throughout the day on Sunday, June 5th with two powerful men of God from Grace Temple Baptist Church in Los Angeles, California! Our day begins with Sunday Morning Worship Service at 10am where our Guest Speaker will be Rev. Cecil Thompson. Later, at the special Anniversary Celebration Service at 4pm, our Guest Speaker will be Bishop Miquail Broadous Sr., Senior Pastor of Grace Temple Baptist Church, Los Angeles, California. All are welcome at both services as we honor Pastor Myron Bradford and First Lady Deborah Bradford. But if you are unable to attend, and desire to express your appreciation, please submit your love offering below. God Bless You!